Vancouver, we love you supporter Justine sent us a picture of her wearing her Vancouver, we love you shirt at Mont-Royal in Montréal, Quebec! 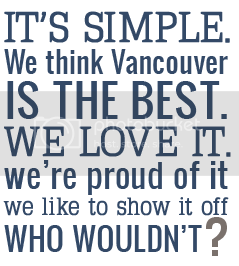 Here's what she has to say about why she loves Vancouver. "I was born in Switzerland and my mom is from Québèc, and I came to Vancouver last year for 8 months to learn English as all European people do! :) And I FELL in love with the city! 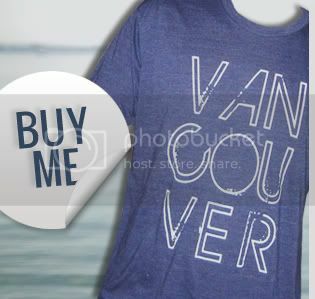 I received your T-shirt as a Christmas gift last year and what can I say, it was an awesome present that I could represent Vancouver in Switzerland. Since January, I moved alone to Montreal to try to live there and work. I'm in the fashion world and I'm currently working for Le Chateau as Technical Designer. A lot of people from Vancouver are working and living in Montréal, and every time I wear your shirt, I receive a lot of compliments!" "For coming from a country with lakes and mountains all around me, I never miss Switzerland when I came to live in Vancouver for 8 months. All the beauty of the nature that you can see in the building in glass, it's just amazing. I was there for the Olympic Winter Games too and it was one of the greatest experience of my life. Working in the fashion world, one of my favorite spots in Vancouver is the fabric store "Dressew," this is "ma caserne d'ali baba" as I could say in French." 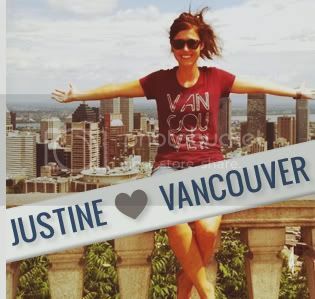 Check out Justine's website here! Do you have a picture of yourself wearing our shirt somewhere? Email it to us so we can post it right here!